Oooh la la! 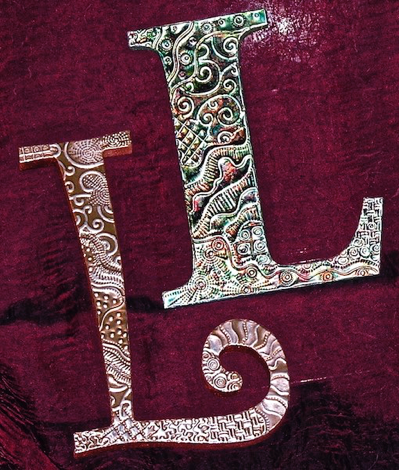 These hand-embossed, oversized letters make GREAT gifts! In this workshop, using simple hand tools, you will learn the basics of Repujado- the fine art of Metal Embossing. Lynda will walk you through various uses for each tool and simple embossing techniques as you embellish your piece of metal. Leave class with a completed letter. NOTE: Letter size will vary dependent upon your letter choice, but generally 8-12” tall. 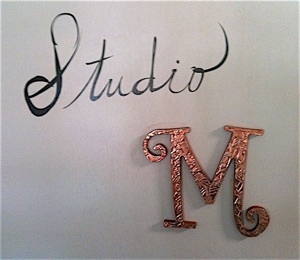 Letters M and W being the widest. Adhesive, walnut ink, alcohol inks and applicators. 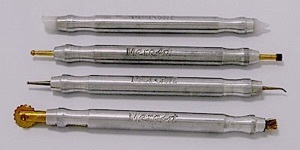 For those who need them, metal embossing tools will also be provided for use in class. ✦Craft knife or X-acto with fresh, sharp blades. You will be cutting artist’s grade aluminum. 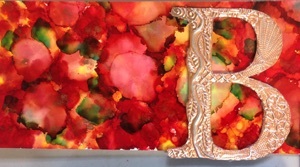 ✦Acrylic paint and paintbrush - Bring your choice of color to be used for wooden letter. *Instructor will provide walnut ink, which stains the wood a pleasant dark brown and leaves the wood grain visible. OR you may bring your choice of acrylic paint and a paint brush. ✦One more thing ... You do have to decide which letter you would like to embellish. Please submit 2 letter choices when you register for this class. ✔ Any metal embossing tools you already have. Sharpie label; it should say “fine point”.